Saint Francis of Assisi was the founder of the Franciscan order of monks. He had several visions of Christ. In AD 1210, he travelled to Rome and Pope Innocent III gave him permission of found the Franciscan order, or Order of Friars Minor. Saint Francis travelled much, and in 1219 he went to Egypt to spread the Gospel. He was canonized in 1228 by Pope Gregory IX. 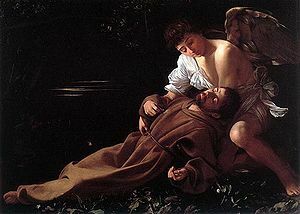 Caravaggio, St. Francis in Ecstasy, ca. 1595. This page was last modified on 26 September 2018, at 14:47.